Fall River MA is a good sized city located about 46 miles south of Boston and 16 miles southeast of Providence Rhode Island. Fall River runs along the Taunton River & is surrounded by Freetown & Westport MA. Fall River's population was 88,945 during the 2012 census, making it the tenth largest city in the state of MA. Fall River MA is 99 % urban and 1 % rural. Fall River is a mix of , apartment buildings,multi family homes,condos, small businesses & stores. It has many shopping centers & the Harbor Mall. Homes in Fall River are very affordable with condo's under $100,000 & up,Fixer uppers starting under $60,000 single family homes starting in $125's and multi family homes around $150,000. Beautiful mansion like homes are offered in the historic Highlands of Fall River starting in the mid 200's up to $800,000. Due to the economy, there are many foreclosure homes in Fall River available. To make your home in Fall River Ma visit Free List of Homes for sale including foreclosures & short sale homes in Fall River. The city is working hard to improve its school system and recently has built a new elementary school. Diman Regional Tech High School received the 2007 Commonwealth Compass school honor. There are many very good private & poracial schools available. Fall River is also the home of BCC, Bristol Community College a two-year, comprehensive community college offering career and transfer programs of study that lead to associate degrees or certificates. There are many good Portuguese Restaurants in Fall River. They include TA's Restaurant known for their shrimp Mozembique, 408 S main St Fall River 02721,The Sagres for lobster and Paella,located on Columbia St Fall River 02721, St. Michael's Club on Webster St. 02723 for Portuguese style steak, the best Clam Boils and award winning soup and the Liberal Club for great fried clams, smelts and seafood bisque. 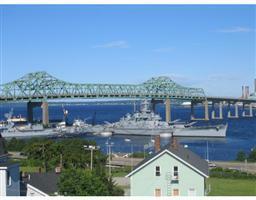 Attractions in Fall River MA include Battleship Cove The world's largest naval ship exhibit. At Battleship Cove, you can board a Navy warship called the The Massachusetts , nicknamed the Big Mamie it is from WWII and is preserved for generations to see. Visit the museum with memorabilia from the bombing of Pearl Harbour and other artifacts from WWII and the Titanic. You can board and experience the tight confinements of the Submarine Lionfish. View the USS Joseph Kennedy that once hunted Soviet submarines during the cold war. For decades this ride made Lincoln Park a fixture in North Dartmouth, MA. today The Carousel is thriving in its new home at Battleship Cove in Fall River MA. Battleship Cove Community Boating (BCCB) offers affordable membership boating classes for both adults & youths, that will have you sailing in no time. Nearby is a nice Walking trail (boardwalk) with views of the Taunton River, Braga Bridge and Battleship cove. The Watuppa Walking trail & Bike path offers views of south Watuppa Pond. Parking is across the street from the Meditech center on rte. 6 in Fall River. The 0.6 mile bicycle and recreation path spans from near the Westport line behind Lepage’s Restaurant ( excellent sea food ) on Route 6 to Brayton Avenue near the Route 24 egress ramps. The picturesque path runs along the northern shore of South Watuppa, where the Fall River branch of the Old Colony Railroad existed. The bike path, which includes several benches and sitting areas, is an effort to make the beauty of South Watuppa Pond publicly available. Bring a picnic lunch, walking shoes, roller blades, bikes and enjoy the natural beauty of this lovely pond. Karen Ann Martin Real Estate Agent in Fall River MA working full time to better serve you.